The eurofighter typhoon provides the operators with a multi-role combat aircraft, capable of being deployed in the full spectrum of air operations, from air policing, to peace support, through to high intensity conflict. This highly capable and extremely agile aircraft is powered by twin turbofans which power the higly capable aircraft up to Mach 2 and 65,000ft. The airframe is largely constructed of carbon fibre composites and light alloys to save weight while the aircraft is equipped with the advanced ECR90 radar, which can track multiple targets at long range. The pilot can carry out many functions by voice command while aircraft manoeuvre; weapon and defensive aid deployment is done through a combined stick and throttle. All of these innovations dramatically simplify operation of the aircraft in combat. Combined with an advanced cockpit that is fully compatible with night-vision goggles, the pilot is superbly equipped for air combat. Initial production aircraft of the F2 standard will be deployed primarily as air-superiority fighters, but will quickly be equipped with a potent precision ground-attack capability. Armament will include the long-range Advanced Medium Range Air-to-Air Missile (AMRAAM), the UK-developed Advanced Short Range Air-to-Air Missile (ASRAAM) and various air-to-ground weapons. Following the tri-national Tornado program, the Eurofighter program began in June of 1986. The Eurofighter program was once again tri-national with Germany, Britain, and Italy(Later Spain would also become part of the program soon after the original countries came together, Germany would also withdrawal later in the program). Their objective was to produce an air superiority fighter by the late 1990's. 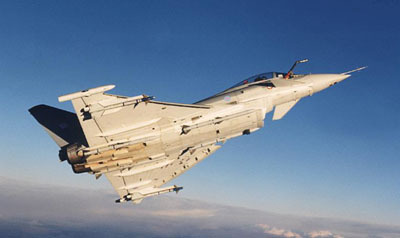 Main Eurofighter concepts include: an unstable aerodynamic configuration with forward canards, a digital fly-by-wire system, complex avionics, multi-function cockpit displays, carbon-fibre composites and the extensive use of aluminium-lithium alloys along with titanium. Barnes & Noble, Inc., 2000.